Astoundingly, about 40,000 tons of dust particles fall to Earth each year which originates from space “leftovers,” mostly from disintegrating comets and asteroid collisions. Scientists are very interested in this dust because of its pristine nature –it is made of the original building blocks of the solar system. Some of that dust also resides in Earth’s atmosphere, and for years, NASA has routinely collected cosmic and interplanetary dust from Earth’s stratosphere with high-altitude research aircraft. NASA announced today that a new mineral has been found from this atmospheric research, in material that likely came from a comet. Usually, any unique dust particles found in the atmosphere are difficult to trace as far as their origin, and whether it came from a comet or other space debris. But this new mineral, a manganese silicide which has been named “Brownleeite,” was discovered within an interplanetary dust particle, or IDP, that appears to have originated from comet 26P/Grigg-Skjellerup. 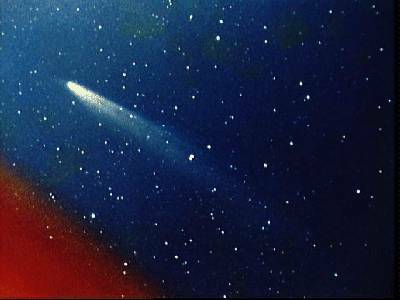 The comet was discovered in 1902 and reappears every 5 years. A new method of collecting IDPs was suggested by space scientist Scott Messenger, from Johnson Space Center. He predicted comet 26P/Grigg-Skjellerup was a source of dust grains that could be captured in Earth’s stratosphere at a specific time of the year. In response to his prediction, NASA performed stratospheric dust collections, using an ER-2 high-altitude aircraft flown from NASA’s Dryden Flight Research Center at Edwards Air Force Base, Calif. The aircraft collected IDPs from this particular comet stream in April 2003. The new mineral was found in one of the particles. To determine the mineral’s origin and examine other dust materials, a powerful new transmission electron microscope was installed in 2005 at Johnson. Brownleeite, is named after Donald E. Brownlee, professor of astronomy at the University of Washington, Seattle. Brownlee founded the field of IDP research. The understanding of the early solar system established from IDP studies would not exist without his efforts. Brownlee also is the principal investigator of NASA’s Stardust mission. Random claim to fame: I grew up in the village neighbouring Sk(j)ellerup; we shared a parish church. Hmm! Wonder if this Brownleeite is MnSi2 or MnSi1.73. Chuck Lam: It could be almost any combination of Manganese (Mn) and Silicon (Si). Both Silicon and particularly Manganese have multiple oxidation states. My guess: MnSi. Do we inhale these particles? Scientists don’t speak like this. Previous PostPrevious Where are the Sunspots? Are we in for a Quiet Solar Cycle?